Bali Rafting + tubing tour is Famous Bali Rafting Tour Package, a combination of Bali whitewater rafting at Ayung river with gorgeous view of waterfall, jungle, bamboo tress and amazing cliff carving by Balinese artist and this adventure will combine with exciting Ayung river tubing for challenge your adventure spirit. 12.00 – Change the raft with tube for Tubing Adventure. 13.00 – Finish Tubing, Going up to restaurant for shower and changes. 13.30 – Having Indonesian Buffet Lunch. 14.30 – Transfer Back to hotel. Join our Bali Ayung Rafting professional for fantastic whitewater rafting experiences, enjoy a unique and unforgettable tour through winding gorges, the lush jungle and the magnificent terraced rice field. The water volume is stable throughout the year with few speeds of water, allowing you to have great fun. All participants will be fitted with life jackets and helmets from our beginning at the start point. 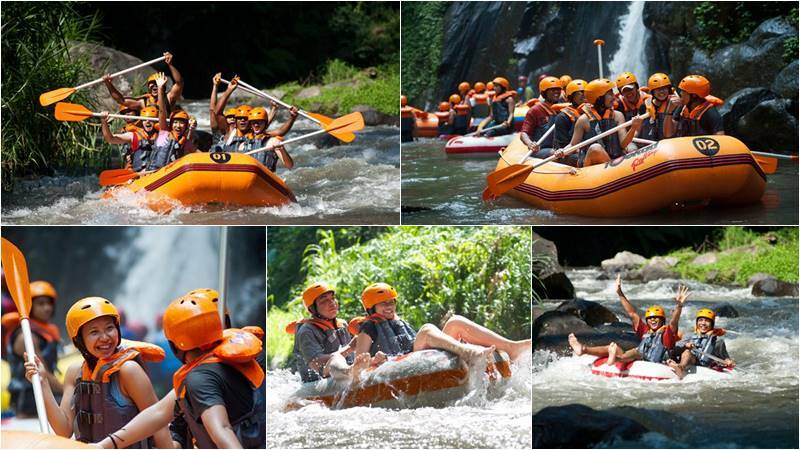 Our experienced guides will lead you through your thrilling Ayung whitewater river rafting. Follow his instructions and paddle along the way, laughing, shouting and experience a tremendous adventure. This is the best way of feeling the wonder of the Ayung River. River Tubing: On the selected spot we will change the raft with tube where you will get more challenge, exciting adventure with our Ayung river tubing for about 1 hours trip.